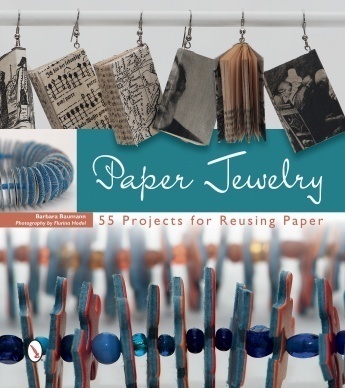 With detailed instructions, templates, and colorful photography, this book shows how to craft fifty-five paper jewelry projects. Colorful and graphic designs range from necklaces, brooches, earrings, and bracelets to hair accessories. Learn how to find inspiration in a wide variety of recycled papers. Projects re-use maps, stationery, comic books, cardboard, magazines, and even candy wrappers. The various projects appeal to a wide variety of aesthetics, from the more traditional and refined to the more contemporary and flamboyant. There are also projects for a wide range of skill levels, making this an inspiring and practical book for everyone from beginners to established jewelry artists. My thoughts: This book is perfect for summertime boredom. It is full of ideas for kids of all ages as well as adults. I haven't had the chance to begin any of the inspiring projects in the book yet, but I am definitely intrigued by the many full-color pages of exciting ideas! I can see myself and my kids making Christmas presents for their teachers! Schiffer Publishing, Ltd. is a family-owned, independent publisher of high-quality, nonfiction books. Since 1974, Schiffer has published thousands of titles on the diverse subjects that fuel our readers' passions. From our traditional subjects of antiques and collectibles, arts and crafts, and military history, Schiffer has expanded its catalog to publish books on contemporary art and artists; architecture and design; food and entertaining; the metaphysical, paranormal and folklore; and pop and fringe culture, as well as books for children.